I’m convinced Pizza is everyone’s favorite food. And why not with its perfect combination of sweet sauce, salty cured pepperoni, creamy cheese, and warm chewy bread. All this, and you can legitimately use your hands to eat it. No forks required! Anytime you combine fats (cheese), salt (meat and cheese), and sugar (sauce and bread), our taste buds and brans go nuts! It’s the trifecta of flavor that provides your brain with a huge boost of happy hormones. What’s not to love? The unstoppable feelings of guilt? Pizza is fun in the moment, but few are left with the feeling of sheer bliss afterwards. …Add fun to the mix and you have yourself a satisfying pizza dinner. Why not spin pizza YOUR WAY with homemade, grilled pizza. I’m not saying this is a nutrient dense meal. I’m not even saying this is best practices. But pizza is the American way. It’s here to stay, so let’s work it in your favor. Grilled pizza is one of our family’s favorite weekend meals. It’s perfect for a crowd, allows each person to customize his own masterpiece, you have the flexibility to keep ingredients relatively on the healthier end of things with quality sourcing, and it’s lots of fun with less prep and kitchen mess too! Preheat grill to medium low heat and brush grill grates with a small bit of oil. Using a serrated knife, gently quarter each pizza dough to make 8 smaller pieces of dough. Shape into 8 small balls. With a rolling pin or with your hands, roll or stretch each dough ball into a crust to desired thickness. Irregular shapes are fine, making a fun, rustic pizza. Place 2-3 crusts on each baking sheet, without overlapping. Set aside. Set up the pizza bar for your family or guests by placing desired toppings in bowls, (disposable, paper bowls for easy cleanup). When ready to prepare pizzas, brush one side of each crust with a small bit of oil and place crust oil-side down on grill grates. You may have to do this in batches. 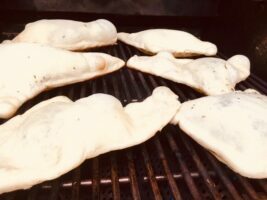 Grill ONLY ON ONE SIDE, until grill marks form and crust bubbles, approximately 1-3 minutes. 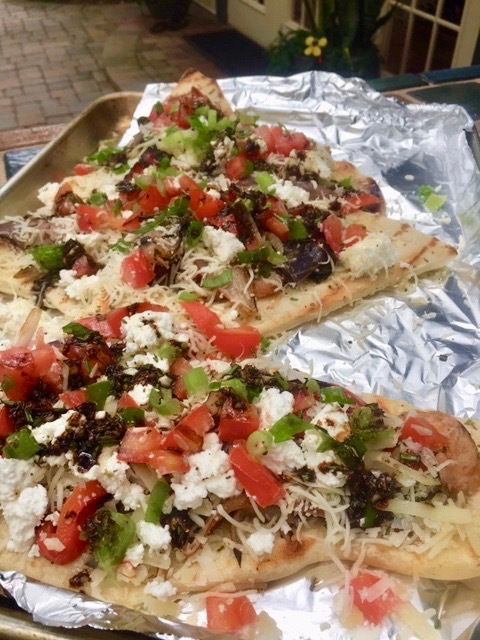 Remove crust(s) from grill and bring to pizza bar topping area for friends to assemble toppings on the already grilled side (you’ll put the raw crust side back on the grill to finish cooking. 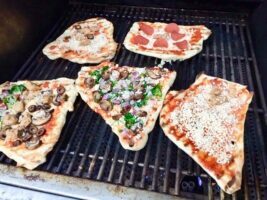 Once toppings are completed, return pizzas to the grill to finish cooking on the uncooked, raw side. Reserve foil to wrap leftovers. Grill 2-3 more minutes, or until cheese is melted, toppings are warm, and the bottom has grill marks. ← DINNER 5 WAYS: FAST, EASY, FUN!